Earn your viewers trust with a professional eye catching design with all the dynamic features you could imagine, straight from the industry leaders. Your template can provide a positive experience, converting potential sales into actual sales. We provide 24/7 customer service to our customers. Our developer team deliver the project on time. We always update to keep up to date with eBay. Our support team reply all emails within 24 hours. 100% Mobile / Tablet Responsive. Simple HTML5 codes, SEO Friendly. No Active Contents or HTTP links. Clean design and easy to edit & modify. One time payment and no use limit. 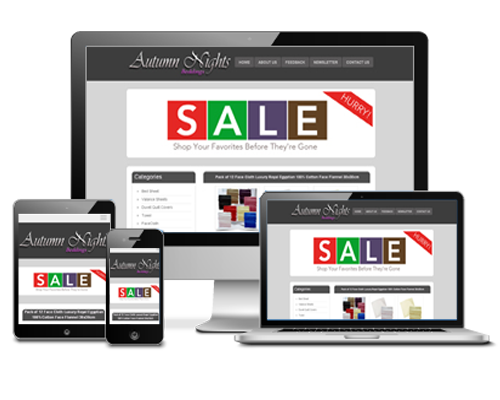 100% Mobile / Tablet Responsive Templates, HTTPS links, no Active Content Used and Simple HTML coding and SEO friendly. Creating template and hiring web developer will cost time and more money. Using pre-made our templates can save your time to listing creation time that could be better spent increasing sales and growing your business. 24/7 customer support. We answer every email within a 24 hour period (usually sooner). This is Ultimate Listing / Auction Template. 100% Mobile RESPONSIVE Templates, HTTPS links, NO Active Content Used and Simple HTML/CSS coding. Our templates are full compatible with eBay's new policy and rules and we keep our template up to date. Template container/box Width 1024px(Auto) / 90% approximately and Height is auto, which is fit to eBay listing desciption area. Our Mobile Responsive will prefectly fit to mobile devices, tablets and desktop devices screen. 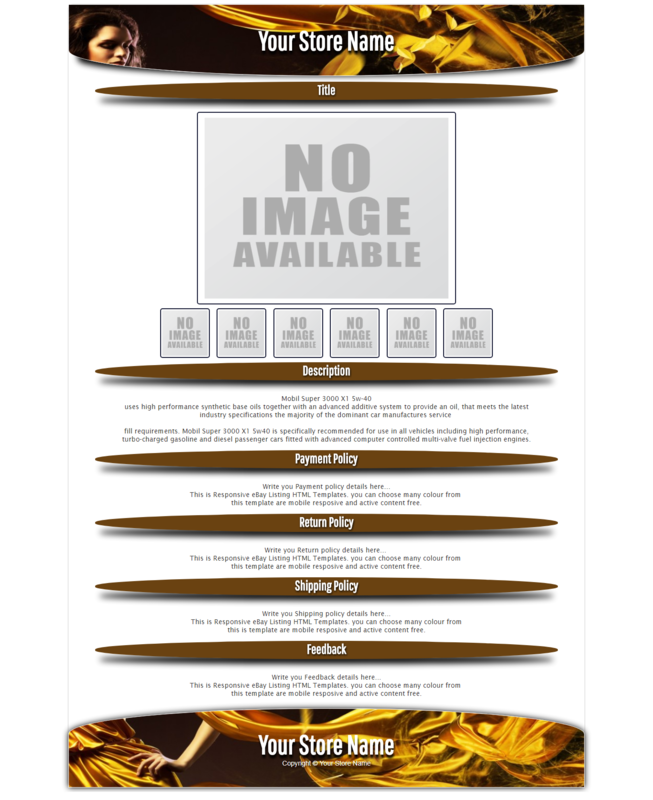 This template comes with Zoom gallery and hover image gallery which is switch image gallery. All templates mock-up images are generated automatically there is one style of template images not showing properly. For Example Incorrect mock-up image - Correct mock-up image. Please note : There is no issue with template only mock-up image for display not showing properly. if you any question, free feel to contact us. Package includes template images folder, HTML file and instrucation manual. All templates files are compressed in ZIP folder. Our new HTML editor, allow user to edit HTML template without editing HTML code. Easy to add product images link (Add images from Google Drive or Manual link option), categories links, add details and banners. When user makes changes on HTML editor; we save all data on our server so every time user login to account they NO need to repeat whole process again & again; just add product image and description and generate the HTML code for eBay listing. HTML editor comes completely free for all our users. Creating template and hiring web developer will cost time and more money. Using pre-made our templates can save your time to listing creation time that could be better spent increasing sales and growing your business. Our templates comes with very simple 4 steps cunfiguration gulide line and fully customisable for any templates for any business. The amount of time and money people are spending on mobile devices is growing rapidly and yet many businesses don't have a website optimized for mobiles. Mobile web browsing is expected to turn into the next major Internet platform. It is now easy to browse the net from nearly anywhere utilizing mobile devices that fit in a hand because of technology. Our templates are full compatible with eBay new policy and rules and we keep our template up to date with eBay. Our template is full compatible for eBay listing / shop and will work with all major listing creation tools, including Seller Hub, Auctiva, Ink Frog, Garagesale, and more. Our Mobile Responsive will prefectly fit to mobile devices, tablets and desktop devices screen.